Born 1900 (d. 1987) Oconee, Georgia lived in Athens, Georgia. "Self Taught, Outsider, and Folk Art" researched and written by Betty-Carol Sellen describes Hall as having been "born into a tenant farming family." He later served in the army in Belgium during WWII. After his return state side, he performed a variety of jobs including "hotel work, work for the highway department, and (work) as a waiter." Arthritis curtailed such work at a later stage. He originally made sculpture which depicted the "devil in various activities, and some fanciful human and animal figures." His sculpture was built with wood, metal, clay, and cement; later painted with common house paint. At that stage when his arthritis became too painful to build his sculpture, he began to draw. 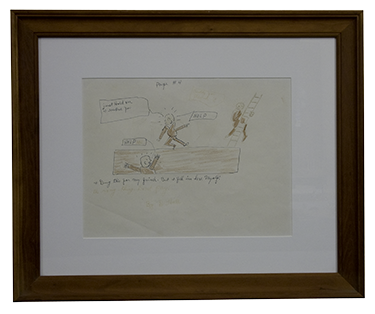 We were fascinated with the drawings and the "ballooned" verbiage he included in his drawings. In observation, his drawings seem similar to a newspaper cartoon. Although some were outlandish, funny,... others seem quite didactic. 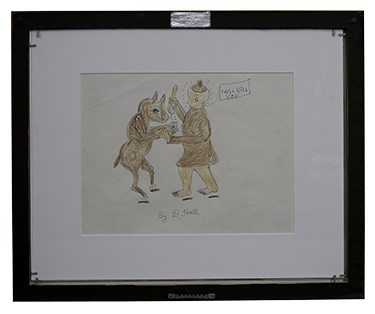 We purchased our two sided ink and crayon drawing at an auction of Howard Smith's collection at Kimball Sterling in Johnson City, Tennessee in 1994.